Spring is in the air! The sun has been shining and the weather has been getting warmer. I’m starting to have some serious spring fever. It’s not that we haven’t had warm weather recently because all winter was a cross between warm and sunny and cold and cloudy. It was a weird winter. I’m just ready for warmth and sunshine all the time. Thinking of spring makes me think of pastel colors, Easter, and flowers. I wanted to make a dessert that reminded me of spring so the first thing I did was go shopping for pastel colored candy. 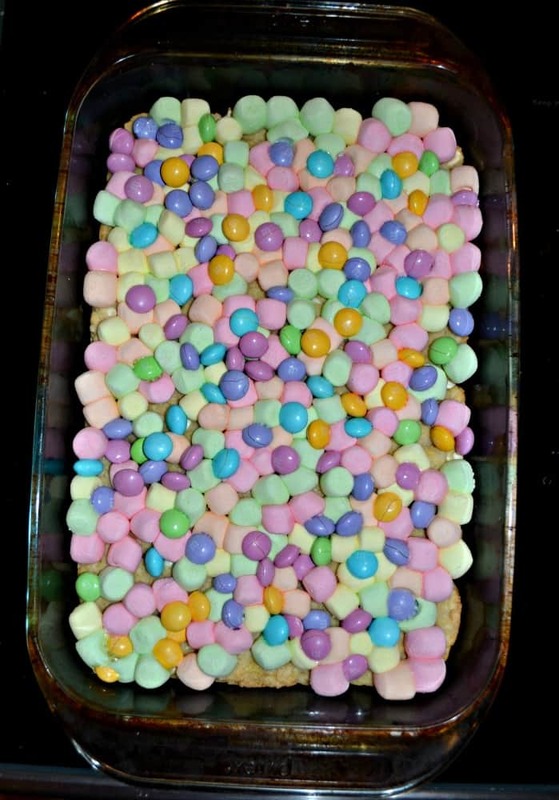 I found some white chocolate pastel colored Easter M&M’s that looked delicious. I also bought some pastel colored fruit flavored mini marshmallows. I thought the combination would make a great cookie bar. The base of my cookie bars was a basic sugar cookie recipe that I added white chocolate chips too. White chocolate just seems more springy then regular chocolate. 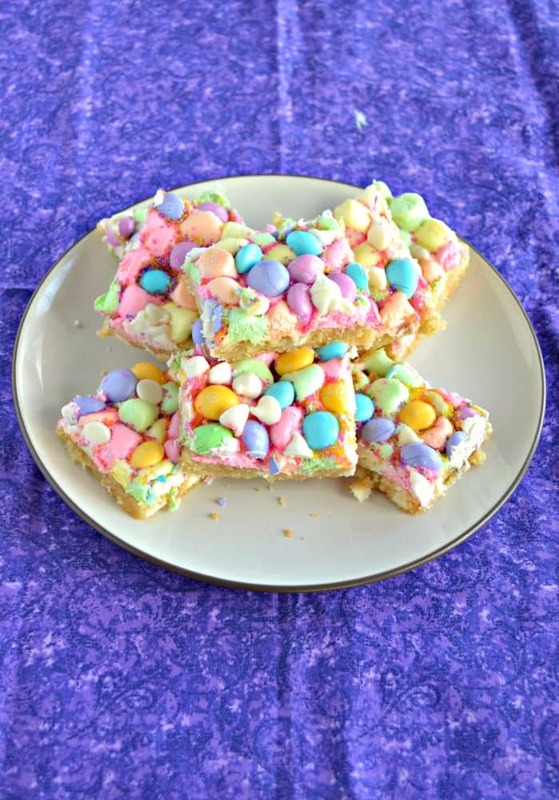 I baked the bars until they were almost cooked through and then topped them with the white chocolate M&M’s and marshmallows. Once they came out of the oven I sprinkled on additional white chocolate chips and sprinkles. The bars looked so fun for spring. 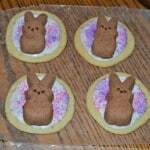 They were covered with the pastel colors and sprinkles. The best part about these bars is that you can really put whatever you want on top of the cookie bars or even in the bars. 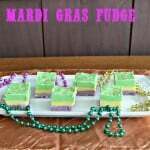 I took these to a get together with a bunch of friends and they were eaten up quickly. I will give a warning to cut them into small squares because they are super sweet. The cookie is sweet and dense while the top is sugary and delicious. 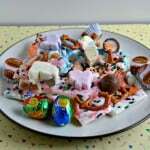 Kids will absolutely love these fun cookie bars and so will the adults. 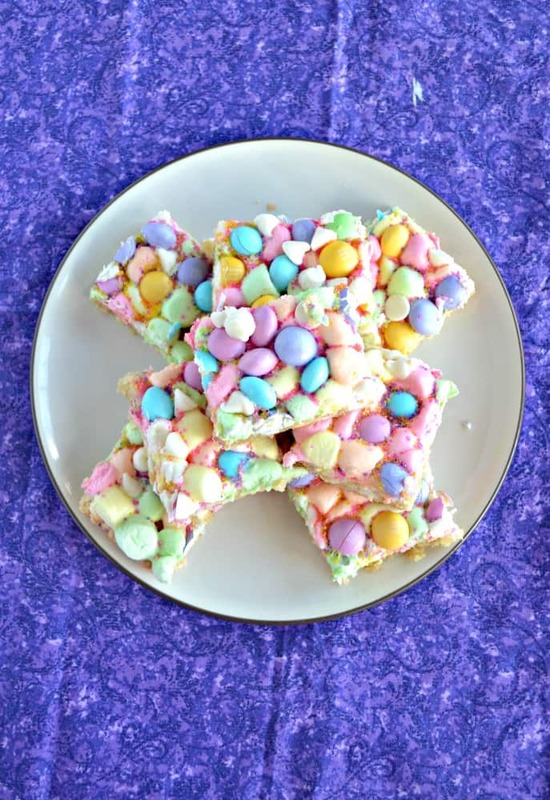 A sweet sugar cookie stuffed with white chocolate chips and topped off with pastel colored M&M's and marshmallows. In a large bowl combine the butter, sugar, and brown sugar. Mix well to combine. In a medium bowl combine the flour, baking soda, baking powder, and salt. Mix and then add to the butter mixture. Mix until combined. Gently fold in 1 cup of the white chocolate chips. Spread into a 9 x 13 pan sprayed with cooking spray and then bake for 15 minutes. 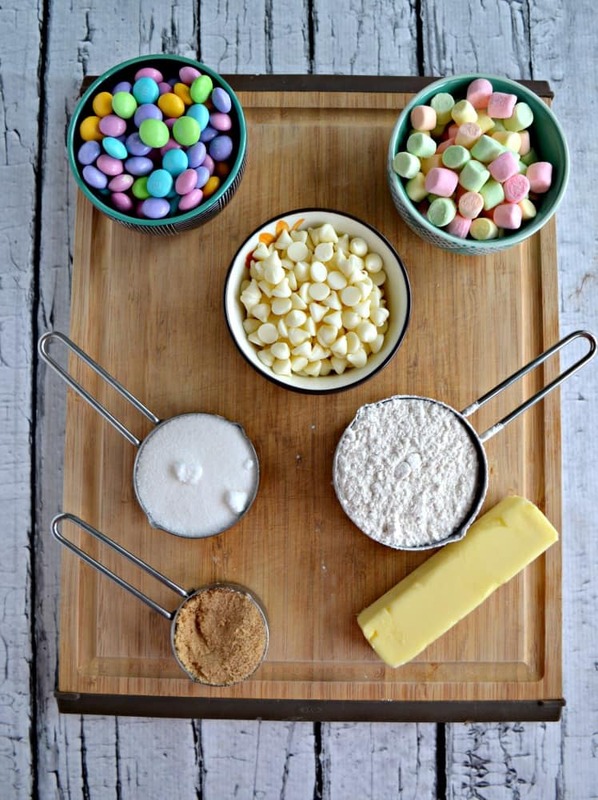 Remove from the oven and sprinkle with marshmallows and M&M's. Place back in the oven for 3-4 minutes or until marshmallows just start to brown. 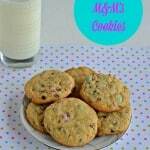 Quickly sprinkle with remaining white chocolate chips and sprinkles.